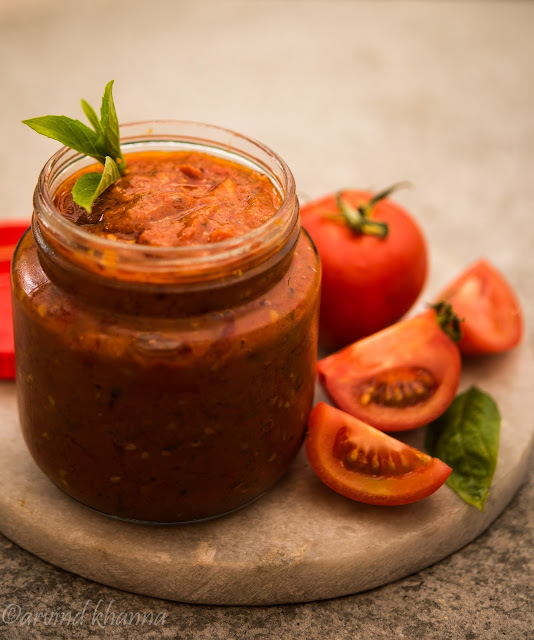 Tomato concasse is the classic pizza sauce that can be used for tossing up a quick pasta dish or even for mixed vegetable stir fries. Home made pizza or pasta sauce is a must in my kitchen as I find the bottled variety loaded with unnecessary chemicals. Years ago I had seen a chef on some TV cookery show making authentic tomato concasse. I liked it and started making it regularly and it became a staple in my kitchen. Now I make it in large quantities and keep in the freezer. Needless to say I use it in many ways, it is so versatile that apart from pizzas I use it to make my pastas, in sandwiches and what not, the frozen container of tomato concasse comes to my rescue when uninformed guests come or when the guests stay over for a few days. I am able to make some quick and tasty stir fries with any vegetables handy in season. Although my version of tomato concasse is a bit different from the recipe I saw on TV. I have omitted cheese from the concasse and add it as required for the recipe I am following for the final dish. red bell pepper 1 no. ** Using onion and garlic powders instead of fresh onion and garlic is quite helpful most of the times. Use 2-3 tbsp onion powder and 1 or 1.5 tbsp of garlic powder if using, dissolve both together in 1/4 cup water and add in hot oil as suggested in the recipe. Normally tomatoes should be blanched first and skinned and seeded, but I make it short by using fresh chopped tomatoes. Heat oil in a pan and throw in the garlic, stir and after a minute add the onions too, add the onion garlic powder dissolved in water if using instead of fresh onion and garlic. Fry till translucent and trow in the chilly flakes and then the chopped tomatoes, salt and sugar. Keep stirring and cooking over medium flame till a thick paste is formed. Add the oregano and tomato paste and let simmer for 10-15 minutes. It is ready as soon as the sauce becomes thicker. Basil can be added during cooking or when making a recipe with it. Cool and keep in the freezer in ziplock pouches. It can be used fresh for making any recipe too. 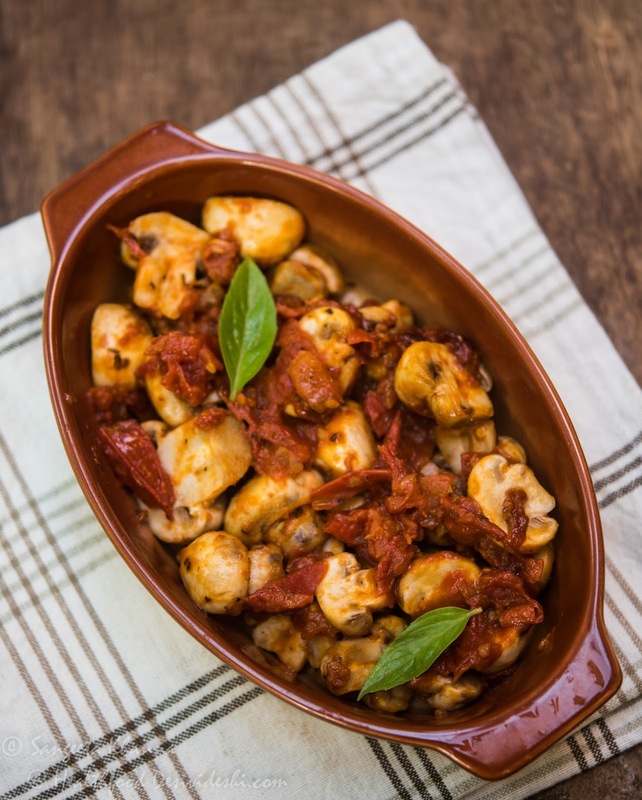 Mushrooms particularly are the ones which are easiest to cook in my kitchen (I get very little time to cook mostly) and as I grow my own basil plants, imagine how aromatic and fresh a recipe it is. This time I made it for lunch with a special side dish which is my next post. fresh basil leaves 2-3 nos. Pour a cup of thawed tomato concass' in a pan and simmer for a minute. Add the sliced mushrooms and keep stirring until mushrooms are cooked but not mushy. Serve garnished with fresh basil leaves. It makes a healthy low fat subzi or a sandwich filling. The leftovers were used to stuff my multigrain bread sandwiches, grilled. Add some boiled whole grain pasta and another dish is ready with mushrooms and home made tomato concasse. 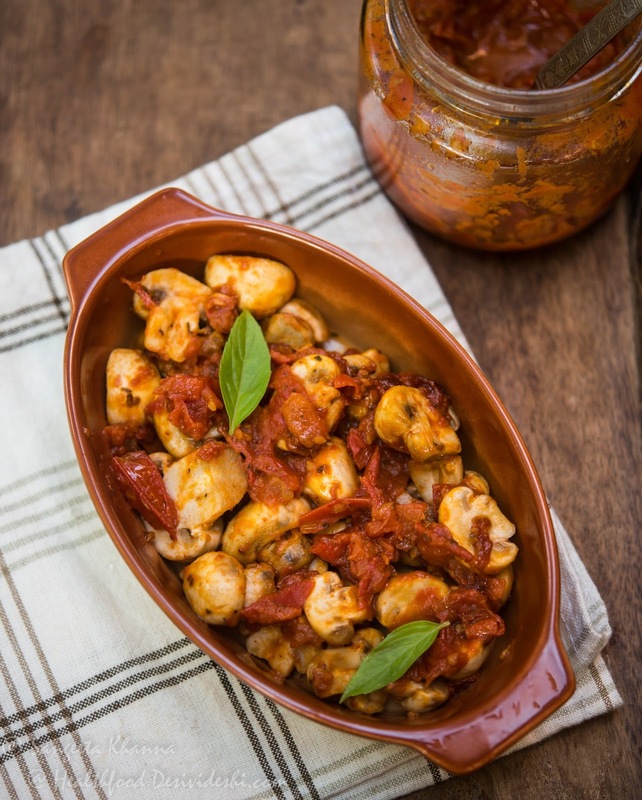 This is indeed a nice pasta or pizza sauce to keep in the freezer, the required cheese can be added when making the pasta or pizza. This sounds great! I love mushrooms and am always looking for a new way to make them.